Roz Griffiths replied to Robin Strathdee's topic in Can I have ___? If you mean curd as in curds & whey, then no. If you mean curd as in lemon curd, then no. I could have just said no, couldn't i? Toad-in-a-hole!!! You've just reminded me of the one thing it'd be worth eating gluten for! 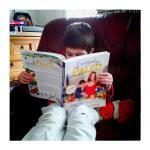 Roz Griffiths replied to OrganicMom's topic in Can I have ___? Ha! It's looking more like Wednesday AND Thursday AND Friday eat belly pork! Yay! Lol! Dare you to actually pack some lambs kidneys one day!